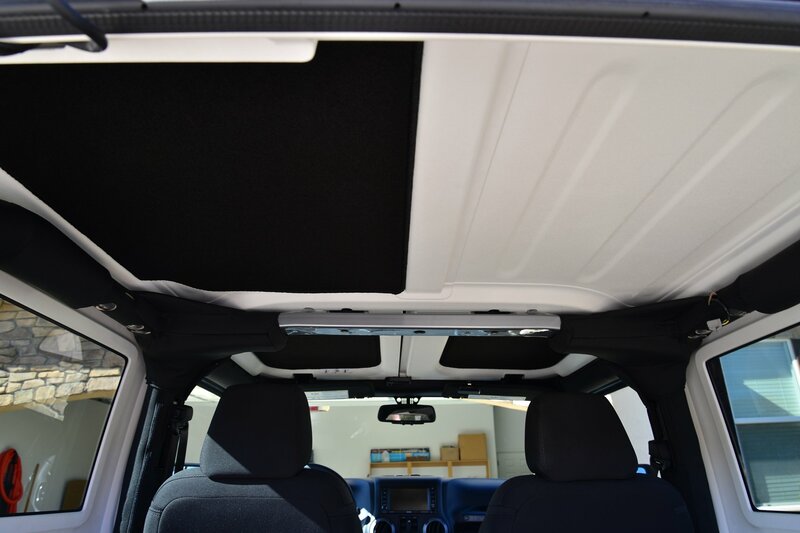 Jeep JK and TJ Wrangler hardtops provide protection from the elements, but the hardtops are single wall construction and afford very little insulation. This means that when it's cold or hot outside, it's cold or hot inside. The Wrangler's HVAC system struggles to keep the interior comfortable when the weather's extreme (especially when it's extremely hot). 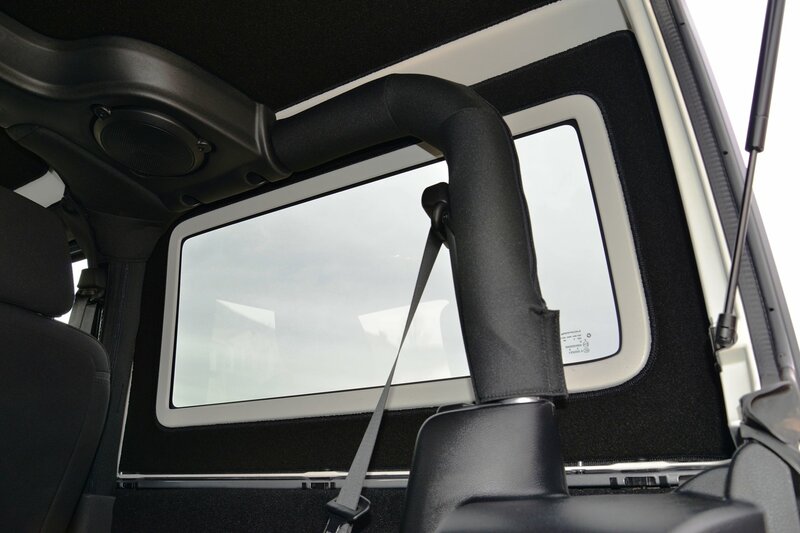 Headliners are the solution to a more comfortable Wrangler interior and are a must-have product if we run our Jeeps with a hardtop and want to stay comfortable. 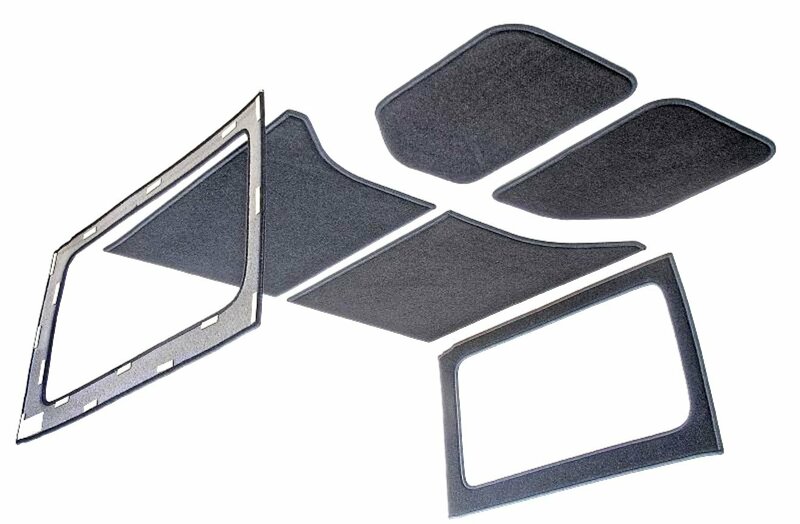 Jeep agrees and now offers Mopar headliner panels as a factory option on all Wranglers. 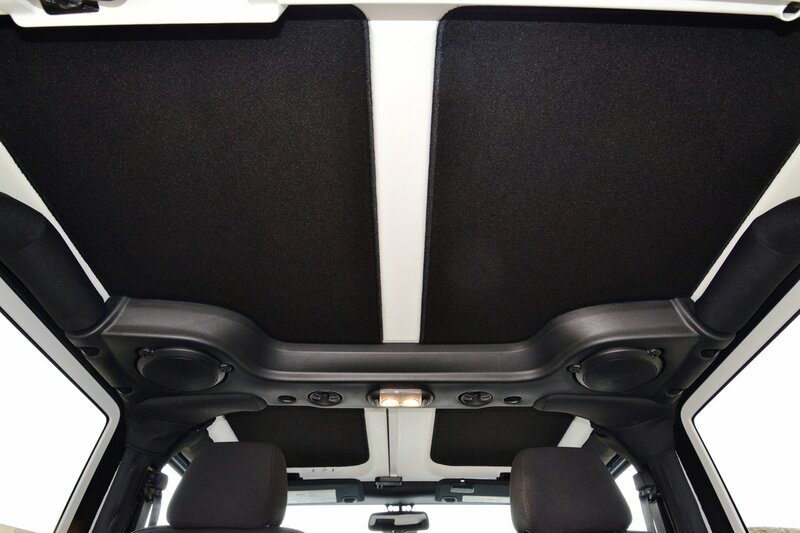 Mopar has made these very same headliners available to those who own 2011-2015 Wranglers: MOPAR® Hardtop Headliner. 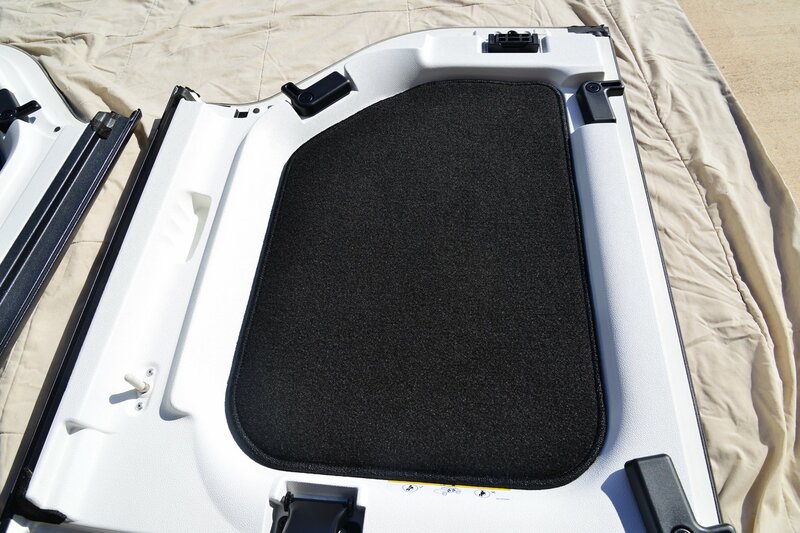 The Mopar headliners are headliner fabric similar to Wrangler carpet on 1/8 inch foam with adhesive transfer tape that permanently attaches the panels to the hardtop. They install easily and took about 20 minutes for the entire job. As the panels come from the same people that built our Wranglers, the fit is perfect. Once in place, Mopar headliners look great and insulate well. I’m looking forward to enjoying the Wrangler with its new Mopar headliners. It will be warmer in the winter, cooler in the summer, and a little quieter all the time. This installation is in my Wrangler 2-door. 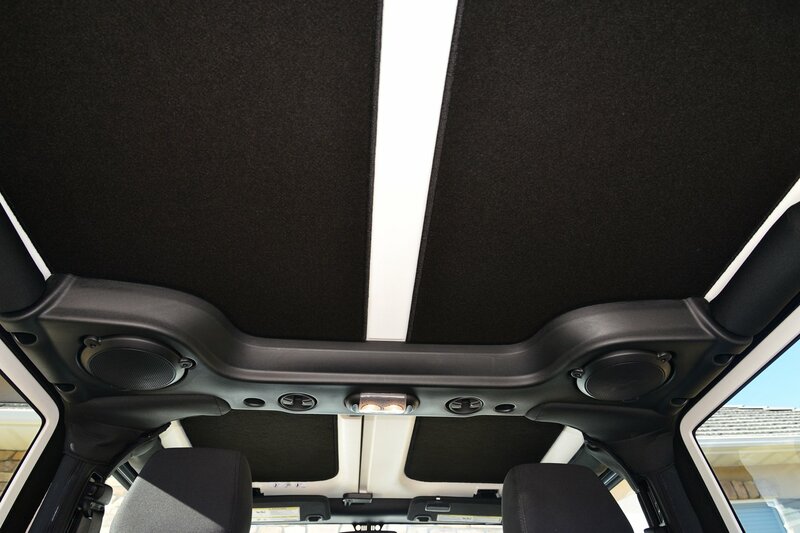 Wrangler Unlimited 4-door headliners are also available: MOPAR® Hardtop Headliner for 4 Door Wrangler. Follow along and I’ll show you how to install them . . . 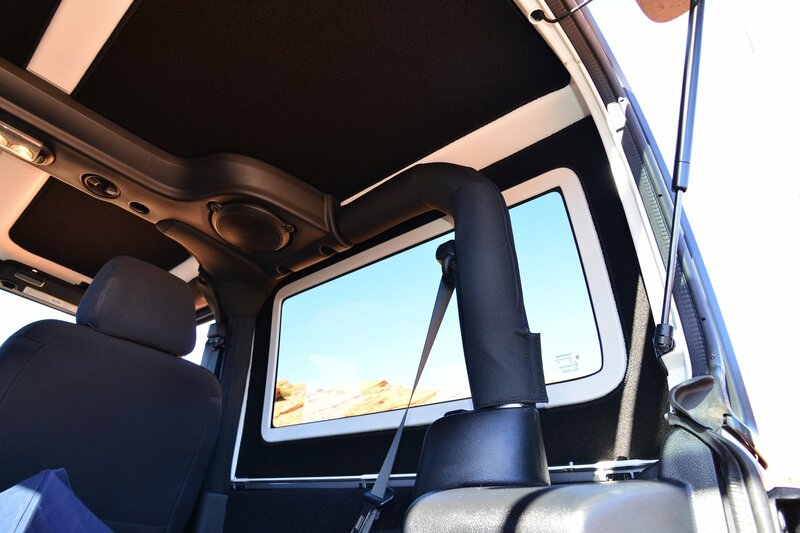 The Mopar Wrangler headliner comes with six panels for the Wrangler 2-door. 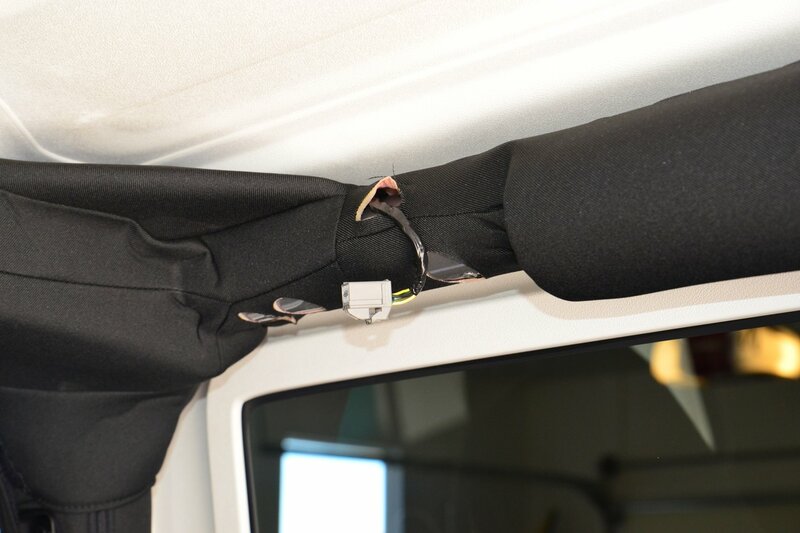 The short adhesive strips shown in this Mopar photo have been changed to long strips for easier installation. First, ensure the air temperature is between 60 and 110 degrees F. Then, remove the sound bar. 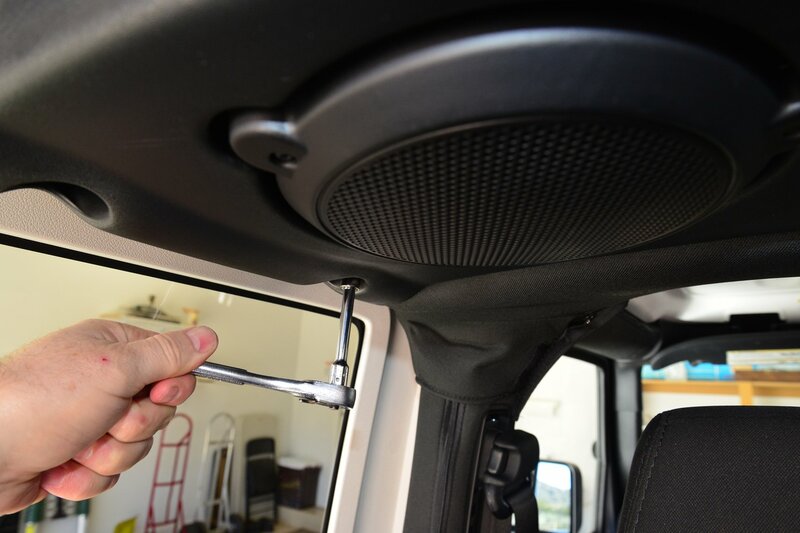 It’s easy – just remove the three 10mm bolts on each side and unplug the plug on the passenger side of the sound bar. The plug is easy to disconnect by pressing on the clip at the bottom of the plug. With the sound bar removed, it’s easy to access the entire roof to apply pressure to the panels. 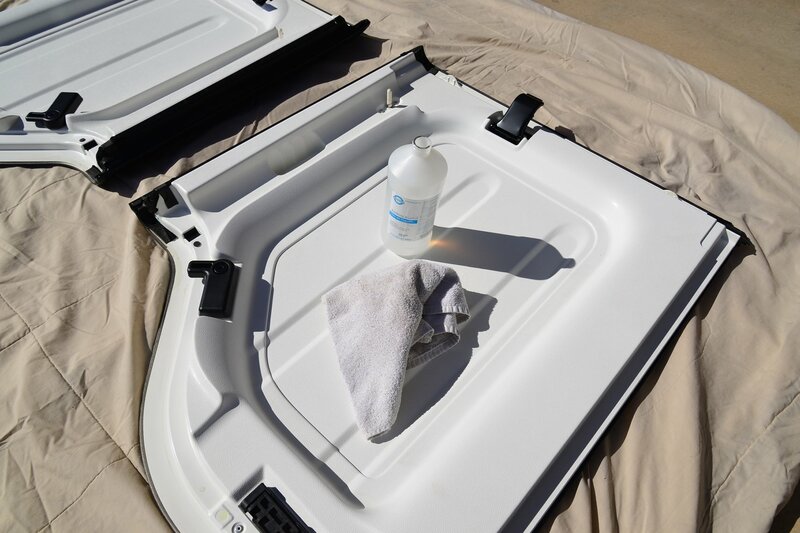 Remove the front Freedom Top panels and clean with alcohol. Remove the backing tape protecting the adhesive strips. Be careful not to touch the adhesive strips. Place the headliner panel in the roof. This is a little tricky, as the tape STICKS, so do this carefully. Mopar’s instructions say press in place using 20 pounds of force. What’s 20 pounds of force? I just pressed in place, then pressed again. Now, on to the rear panels. 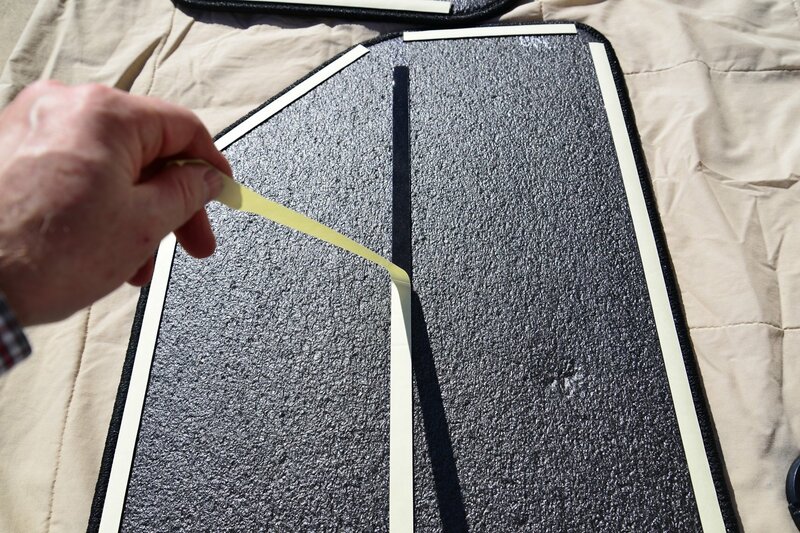 Clean the roof with alcohol and test fit the panels before removing the backing tape. Then, remove the backing tape and press in place as you did up front. An assistant will make installation easier when placing the panels and pressing them on, although I did it by myself. The window panels fit nicely and insulate the sides of the hardtop. When installing, fit the panels in place first, then reach around behind and remove the backing tape. After the backing tape’s removed, press into place. If the tape’s removed before placing the panels, they’ll stick to places you don’t want and be difficult to install. Connect the sound bar plug and reinstall the sound bar. It’s easy and all holes line up without issues. The Mopar headliner looks great. In the field, the headliner with side window panels made things a little quieter and the temperature in the Wrangler was noticeably better. Before installing the headliner, place your hands on the bare hardtop interior and notice how cold or hot it is when temps are extreme. 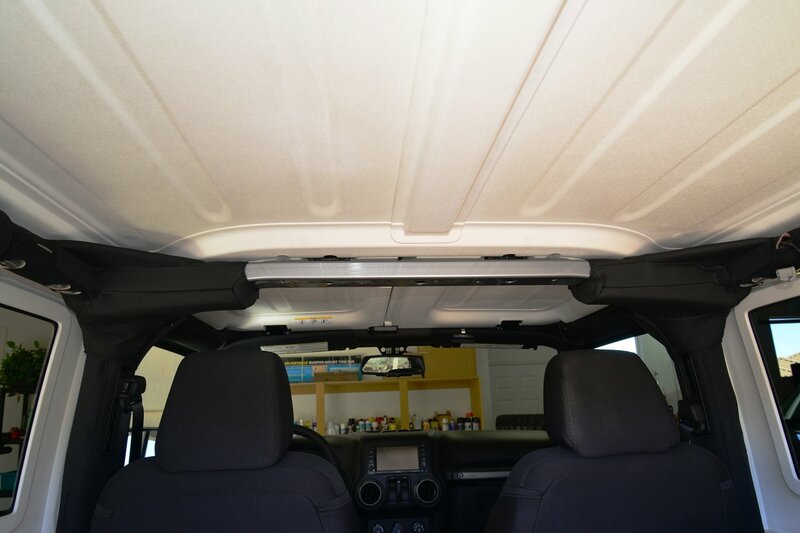 Once the headliner’s installed, feel the top. Temperature is mild and the HVAC system is able to do its job.